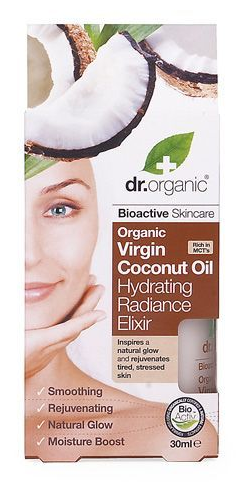 Dr. Organic is a great emerging UK beauty brand that is committed to quality products at affordable prices. It has already won several awards and the range keeps growing and adding to its already fabulous repertoire. One of their exciting new ranges is the Organic Virgin Coconut Oil range, and I’m already a fan. I tried the Hydrating Radiance Elixir, which is a light treatment you can use alone, as a pick-me-up or before your moisturiser. I normally like to use a serum when I need extra hydration, but the texture of this elixir is light enough to be instantly absorbed into your complexion. It provides your skin with much-needed hydration as it infuses it with organic extracts and tropical oils to bioactively re-energise and rejuvenate. But its piece de resistance is its scent: Not only does it smell incredible (it’s like sweet coconut ice cream!) it also reminds me of being on holiday, giving my mood an instant boost. The result? A happy, radiant complexion. For more information go to www.doctororganic.co.uk. Available at www.hollanandbarrett.co.uk, priced at £12.00. This entry was posted in Skincare and tagged coconut, Dr Organic, Elixir, holland and barrett, Hydration, nourishing. Bookmark the permalink.